As the reader can see, we have answered this question by looking, hospital by hospital, at a wide variety of other factors besides what hospitals claim there transplant numbers to be. We looked, for instance, at bed numbers. Bed numbers give us totals for physical entities and are likely to be accurate. Yet, they are not in isolation a perfect indicator of transplant numbers because beds are fungible and can be used for non-transplant purposes. This is less likely in a transplant hospital or a transplant wing of a hospital, but still possible. Even if beds are used only for transplants, we need to make allowances for use of beds for waiting and recovery times, which are not fixed. The claims of local hospitals that they are transplanting huge numbers do not have to be taken at face value. That is one reason why we have not come up with a specific figure about transplant volumes. But they surely make ever more urgent the need to comply with the duties of transparency, openness to scrutiny and accountability. The large numbers the national system produces already impose the need to comply with those duties. The much larger numbers the totals which individual hospitals, in combination, claim impose this duty of compliance with even more force. Over time, instead of increasing transparency, China has been going in the opposite direction, increasing opacity. There has been increasing cover up; the Party/State wants to hide something. What it wants to hide we can often see, because the Party/State has been systematically blocking our reports and taking down sources we cite from their websites. The fact that our reports and their own data sources which we use to substantiate our work systematically disappear once we use them does not indicate that what is blocked and deleted is true. But it does show that what is blocked and deleted does not coincide with the current political stance of the Party. Cover up tells a story, a story of what the Party does not want us to see. In this chapter we tell that story. A number of hospital and transplant organization webpages and even websites were deleted after the Kilgour/Matas report was released in 2006. In addition, we observed that some hospitals have merged their dedicated transplant departments and centres back into their parent departments (hepatobiliary surgery, urology, etc.). The more generic departmental structure obfuscates any information remaining regarding transplant capacity and resources. 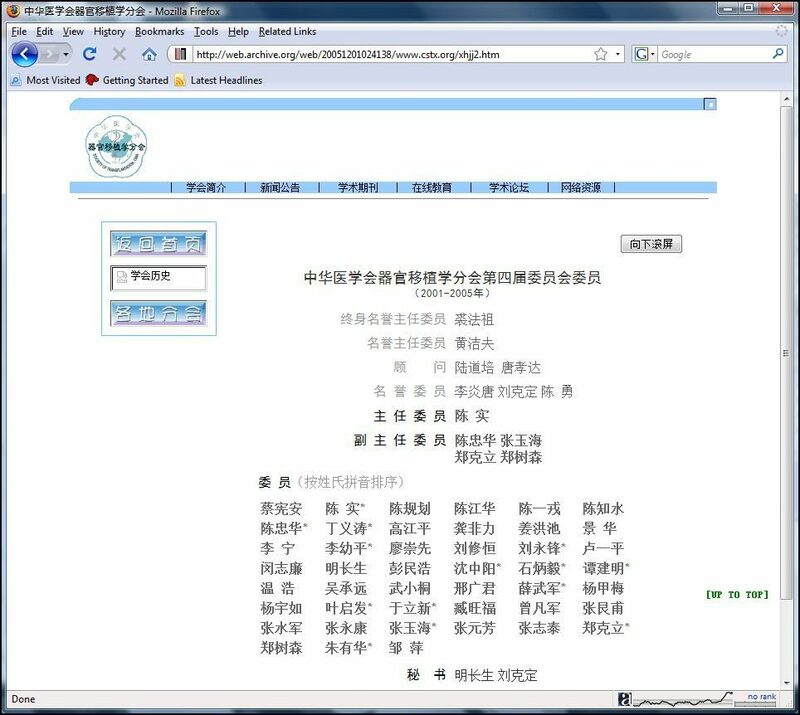 Figure 8.1: The Chinese Medical Association Society of Transplantation website, before it was taken down in April 2006. 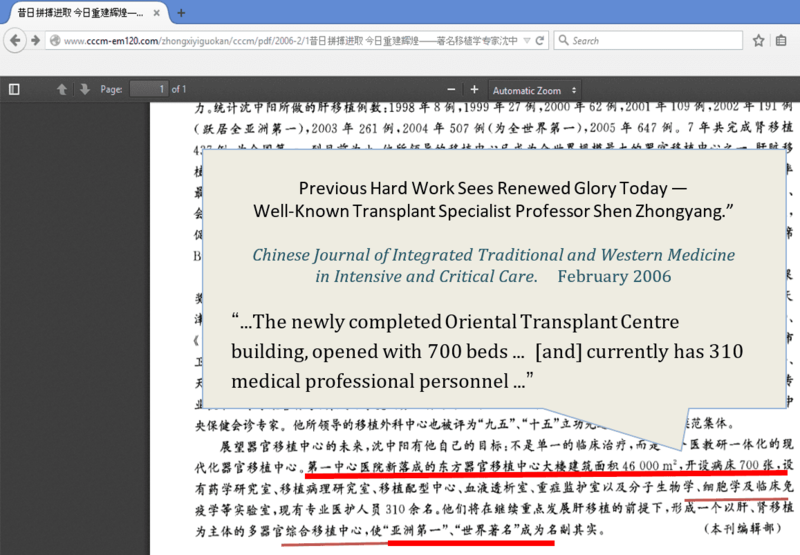 The Society of Transplantation website (http://www.cstx.org/) under the Chinese Medical Association (http://www.cma.org.cn/) became inaccessible shortly after the harvesting of organs from Falun Gong practitioners was publicized on March 9, 2006. Searching for the Society of Transplantation website stored on www.archive.org shows that the website was taken offline in April 2006. China Organ Transplant Online (http://www.haoyisheng.com.cn/html/qywz/qgw/default.html) was established primarily by Beijing Chaoyang Hospital’s urology and kidney disease centre. Transplant Space (http://www.transplantspace.com) was created by the First Hospital of China Medical University’s organ transplant research institute. It included sections on pancreas-kidney, liver, and kidney transplants, as well as a discussion forum. 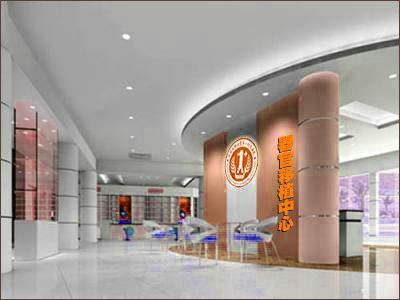 The Chinese Renal Transplant Collaboration website (http://www.web-kidney.com/zxjj.htm) was operated by Zhengzhou Central Hospital’s kidney transplant department. The Central China Military Renal Transplant Collaboration website (http://www.china-kidney.com) was operated by the People’s Liberation Army No. 460 Hospital’s urologic surgery department. It included online appointment registration and a transplant Q&A section. The website contained a video of a kidney transplant surgery and offered an organ transplant matching software for download. 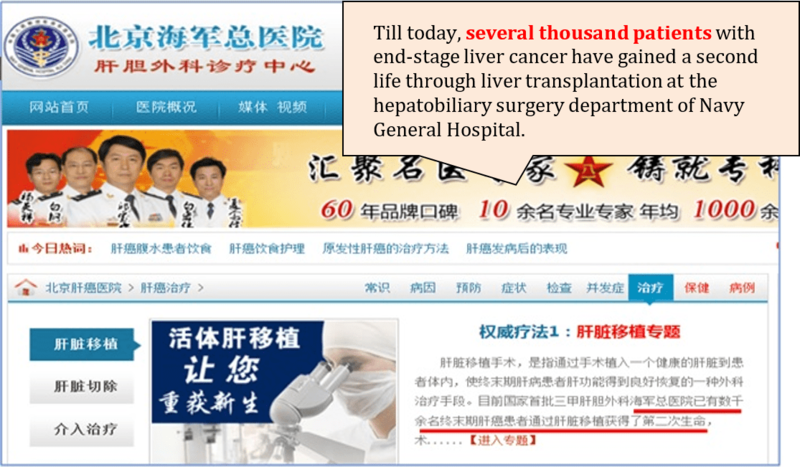 The Huazhong University of Science and Technology Organ Transplant Research Institute’s website was http://www.tjtx.org/. The Kidney Disease Treatment Centre website (http://www.cnur-dc.com) belonged to the Beijing Chaoyang Hospital’s urology department. The Organ Transplantation website (http://www.gaowei.com/) belonged to Dongguan Humen Taiping People’s Hospital’s Blood Purification and Organ Transplant Centre. The report stated that the hospital set a new record by performing 2 liver, 7 kidney, and 8 corneal transplants in one day. Clicking the link to the report titled “Our Hospital Again Sets a New Record in Organ Transplant Surgeries” results in a message saying “The content you are looking for has been deleted, renamed, or is temporarily unavailable.” Other articles in the same list were still accessible. 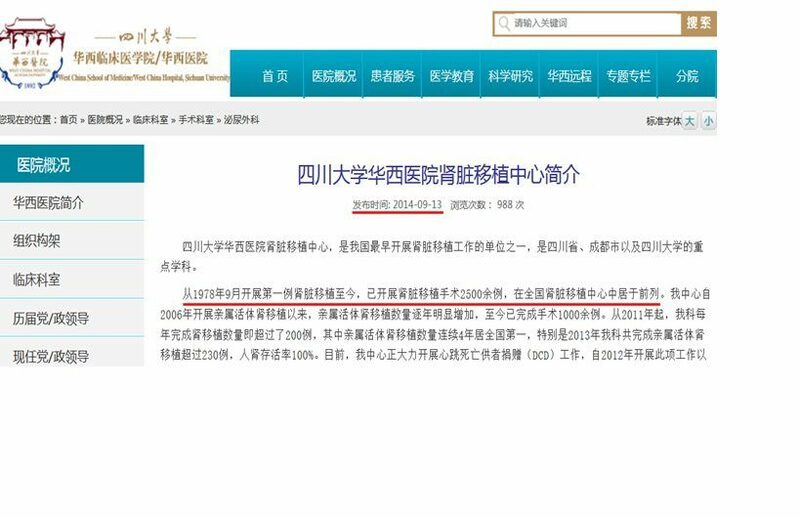 Figure 8.2: A link to the deleted report "Our Hospital Again Sets a New Record in Organ Transplant Surgeries” on Xiangya Hospital's news portal. The website of the China International Transplantation Network Assistance Centre (CITNAC) was shut down after live organ harvesting was publicized in 2006. The website http://zoukiishoku.com was previously available in Japanese, Russian, English, and Chinese. The Second People’s Hospital of Shanxi has removed almost all transplant-related information on its website and now claims 100 transplants each year. The Third People’s Hospital of Datong City deleted almost all information about its transplantation activities online after the publication of the Matas/Kilgour Report in 2006. For the book Bloody Harvest, David Kilgour and David Matas were able to garner information about transplant volumes from the China Liver Transplant Registry in Hong Kong.1593 After publication of the book, The China Liver Transplant Registry shut down public access to statistical aggregate data on its site. Access is available only to those who have a Registry issued login name and password. For a while after, the names and locations of transplant hospitals reporting to the registry were still public. That listing indicated that military as well as civilian hospitals are reporting. The registry listed 35 national hospitals (including 9 military) and 45 provincial hospitals (including 11 military). After David Matas referred publicly to that data, it too was removed from public view. At The Transplantation Congress in Vancouver in August 2010, Haibo Wang, assistant director of the China Liver Transplant Registry, presented at the same session as David Matas did. David Matas asked him why public access to the data on the Registry website was shut down and if it could be restored. His answer was that public access was shut down because people were misinterpreting the data. If anyone was to get access from then on, the Registry had to know first the purpose for which the data was to be used and have some confidence that the data would not be misinterpreted. The Chinese health system runs four transplant registries, one each for liver, kidney, heart and lung. The other three are located in mainland China – kidney1594 and heart1595 in Beijing, and lung1596 in Wuxi. The data on the other three sites are also accessible only to those who have registry-issued login names and passwords. The Ministry of Health Medical Regulation Notice (2009) #55 included a zero-tolerance policy of suspending the transplant approval of any hospital found not to be complying with human organ transplant reporting requirements. The Ministry of Health Medical Regulation Notice (2010) #105 requires reporting within 72 hours after performing a transplant surgery. Hospitals found to be in violation would have their transplant qualifications suspended. 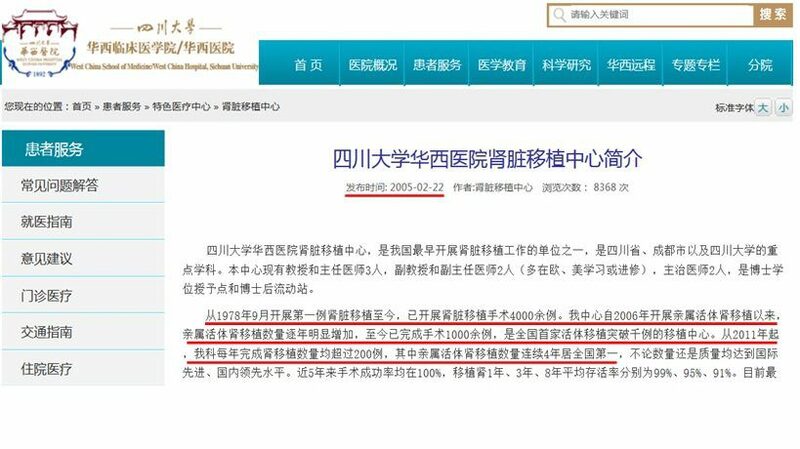 The article cited an example in which Tianjin First Central Hospital (Oriental Organ Transplant Centre) registered only 7 liver transplants (including from living and cadaveric donors) in 2010, yet its public liver transplant figure was 330. Hospital president Shen Zhongyang and Wang Haibo, who manages the national liver transplant registry at Hong Kong University’s Queen Mary Hospital, both declined to explain this discrepancy. Per our earlier analysis, this hospital’s transplant volume is at least 6,000 to 8,000 per year and may reach as high as 7,800 to 10,400 per year. Its registered volume is not even a tiny fraction of its actual transplants performed. Yet, its transplant centre claims to have performed the most transplants in the country and ranked first in the registration system consistently for more than a decade. This suggests that other transplant centres might have registered even fewer than 7 transplants per year. 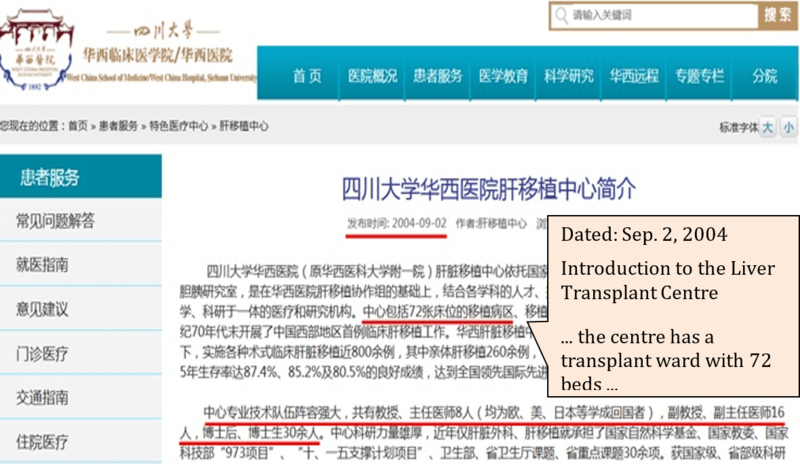 From this example, we can see that underreporting among China’s transplant centres can be described as “severe.” The transplant statistics reported by the authorities are far from reality. One reason for Shen Zhongyang and Wang Haibo’s silence is that these huge volumes of transplants simply cannot be accounted for by organ donations (more details are available in the “Donation after cardiac death” section). Tax evasion has become a common practice for enterprises and institutions in mainland China. In addition to the financial aspect, transplant centres also maintain two sets of books when it comes to transplant volume. In the industry’s early period of growth after 2000, because transplant volume was limited by technology and price of immunosuppressants, hospitals and doctors engaged in high-profile publicity to attract patients. Along with the quick reduction of such bottlenecks, transplant volume increased. For self-financed hospitals, how to protect this surge in profit from taxes became a practical problem. Underreporting transplant volume became a solution. To what extent was it implemented? As mentioned earlier, the Oriental Organ Transplant Centre performs thousands of transplants per year but reported only 7 liver transplants to the registry in 2010. In other words, as of 2014, Peking University People’s Hospital performed fewer than 1,200 liver and kidney transplants in over a decade. This can be considered its public record. Zhu was describing events before 2010. The hospital’s transplant centre moved into its new 470-bed surgery building in December 2005; its website now claims 120 to 130 liver and kidney transplants per year,1602 which is only 1/33 the number stated by Zhu Jiye. It is unlikely that a transplant centre with 470 beds would perform only 120 to 130 surgeries per year. Having analyzed this pattern among the 165 hospitals in Chapters Two to Six, we present a series of representative case studies in the “Falsifying Transplant Data” section. Many hospitals now list living-donor and donation after cardiac death transplants as their signature services or even main organ sources. However, we found that the actual number of donations is extremely low. In 2005, the centre became the Chinese Living-Donor Liver Transplant Research Institute, with two wards, 100 beds, and a laboratory centre. In the same timeframe, its urologic surgery department had 94 beds, and its cardiothoracic surgery department had 120 beds.1605 With surgery costs of one-eighth to one-tenth that of similar procedures outside of China, it has attracted many patients from overseas. Its liver transplant centre had 100 beds by 2005, yet claimed that it can perform 80 to 100 liver transplants each year. However, this annual volume would require no more than 8 beds. The centre has always featured living relative-donor transplants as its signature service. However, in July 2003 it claimed that, among the 100 liver transplants it had completed, 26 involved living donors, that these 26 represented 60% of all living-donor transplants, and that it performed the most living-donor liver transplants in the country.1606 This leaves the sources of the other 74 transplants unaccounted for; it also implies that there had been fewer than 50 living relative-donor transplants in all of China. A year after the pilot programs were started, 46 people nationwide successfully donated their organs, far from meeting clinical needs. In 2011, the Ministry of Health expanded pilot programs from 11 provinces and cities to 21. The one-year pilot period was later extended to at least two years. In 2013, the Ministry of Health claimed that hospitals from 19 provinces and cities were participating, 1620 but it did not release a list of such hospitals. On March 22, 2012, the “National Human Organ Donation Pilot Program Wrap-Up Meeting” was held in Hangzhou. The Red Cross announced that, in the two years after the pilot programs began, China completed 207 donations [after cardiac death].1621 Divided among the more than 147 hospitals that did not receive approval in 2007 but had donation after cardiac death pilot programs, this amounts to an average of less than one donation after cardiac death case per year per hospital. In August 2013, the National Health and Family Planning Commission released the list of 165 hospitals nationwide that had been approved for transplants. Zhongnan Hospital of Wuhan University had been added to the list because it exceeded the requirements for donation after cardiac death transplants. According to Huang Jiefu, Zhongnan Hospital completed more than 20 donation after cardiac death donations and transplant surgeries during the pilot period (2011 to August 2013) and became the first among donation after cardiac death pilot hospitals to gain Ministry approval. He added that future transplants at this hospital would all come from voluntary and post-death donations. Later, four more transplant centres received approvals for transplants in 2013 and the original list has been finally expanded to 169 transplant-approved hospitals. As of February 2016, we searched online and found 75 hospitals that have received permits for donation after cardiac death pilot programs. These hospitals are located in 19 provinces and directly-controlled municipalities. It is apparent that most of these hospitals could not achieve the minimum requirement of 5 or 10 donations after cardiac death to get approved during the pilot period. If Zhongnan Hospital’s transplants really come from voluntary and post-death donors as Huang Jiefu had claimed, these 20+ transplants would have been accommodated by a single bed. Were almost all of the 150 specialist beds and 10 ICU beds sitting empty these few years? Ye Qifa reported that 4,626 citizens in China donated their organs after death between 2010 and August 2015. Even if this number is true, it cannot cover the needs of even this one hospital with its transplant bed count. Government of China Health officials sometimes use the potential to procure multiple organs from the same donor to explain the gap between the number of organ sources (including voluntary donors and executed prisoners) and its official number of transplants. However, this efficiency cannot be applied in most cases. 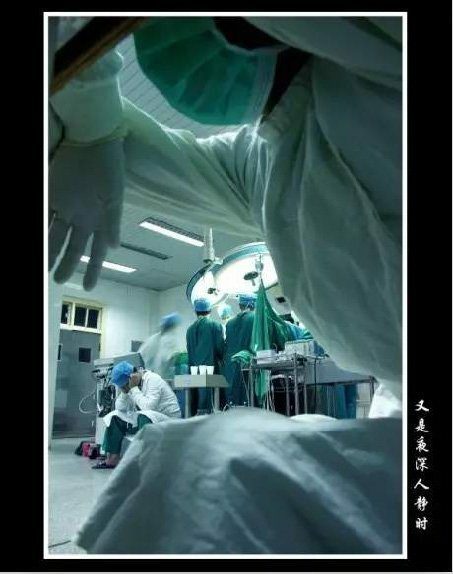 According to a Guangxi News report on December 14, 2012, more than 60 doctors carried out 6 transplant surgeries simultaneously at No. 303 Hospital of Guangzhou Military Command on that day. These included liver, lung, pancreas-kidney, and kidney transplants, as well as two cornea transplants.1622 Dr. Sun Xuyong, president of the hospital’s Transplantation Research Institute, stated that the six organs were procured from the same donor, but did not explain the source of the donor. Lan Liugen, deputy director of the surgery division, indicated in March 2013 that only two hospitals in China had this capability at that time; the other was the Tongji Organ Transplant Research Institute of the Huazhong University of Science and Technology. Some large hospitals publish extremely low bed counts in their surgical departments compared to their scale. Averaging the 3,500 total transplants over 16 years (conservatively assuming a negligible volume before 1999) would yield just over 200 transplants per year, which would require no more than one-third of its claimed bed count. Furthermore, 65 beds would allow the institute to conduct more than 1,000 kidney transplants per year, assuming a three-week hospitalization period and full utilization. Thus, if the institute carries out “thousands” of kidney transplants per year, its true bed count is likely several times higher. The General Hospital of Shenyang Military Command stated that it has “one of the best-known transplant centres in the country,” and that “since it successfully carried out the first kidney allograft in August 1978, the hospital has completed more than 1,700 kidney transplants.” The centre claims to have 36 inpatient beds.1627 This volume of less than 100 per year does not match its high status in the country. The First Affiliated Hospital of Xi’an Jiaotong University‘s website claims that since 1999, the hospital has witnessed a period of “glorious development” in kidney transplantation. As early as June 2000, it said it had completed over 1,140 kidney transplants.1628 However, this hospital was tracked by overseas media since the release of the Matas/Kilgour report in 2006. It has since tried to hide the number of transplants performed, and lists on its website only that it has 48 beds. However, when our investigator called the transplant department under the guise of introducing a patient on behalf of another hospital and inquired whether the department had enough beds, its medical personnel indicated that there was no need to worry, and that they could add beds if needed and even appropriate beds from other wards. The cumulative figure on its website for 2014 was the same as for 2010, and the number Wang provided in 2014 was 100 fewer than that in 2010. The figure of 300 total cases is equivalent to fewer than 30 cases each year, in which case only two beds and one surgeon would be needed. The centre’s archived web pages show that it broke ground on its new building in 2002. The construction was funded by the Tianjin municipal government. The new building had 500 transplant beds, and the Centre aimed for 500 liver transplants and 300 kidney transplants per year.1634 This implies that each transplant bed would accommodate fewer than two patients per year. We can thus see that the centre began to deflate its transplant volume from an early stage. Even if we count it as 500 beds, when it achieved a 100% bed utilization rate (around 2010 by its growth trend), with an average liver transplant hospitalization time of 3 to 4 weeks,1640 the transplant volume may have reached 6,000 to 8,000 per year. With its 131% bed utilization rate in 2013, the corresponding annual volume may have been as high as 7,800 to 10,400. In 2006, the centre had 310 medical professionals.1652 The total number of transplants performed by this centre is huge. However, we found a liver transplant study published by one of its doctors, for which the patient sample size was six times the number of transplants that the hospital had claimed. These samples were only a small portion of a large number of transplants that met the study criteria. Therefore, the hospital’s actual number of liver transplants is most likely well above six times the official number. However, doctors at the hospital published a study in 2008 based on 50 “living relative-donor kidney transplants” between February 2002 and May 2008.1660 Based on this number, in the six-year period between 2002 and 2008, the number of “living relative-donor kidney transplants” is three times the hospital’s total claim for the 33-year period. Another study was based on a sample of 18 out of 84 kidney transplants.1661 From these fragments, one can see that the public transplant volume has been severely deflated. The website of General Hospital of Jinan Military Command states that its urologic surgery department has completed 1,500 kidney transplants since 1978 and ranks among the top ten in China and the top five in the military.1665 These two figures imply that the hospital has performed fewer than 200 kidney transplants per year since 2003. 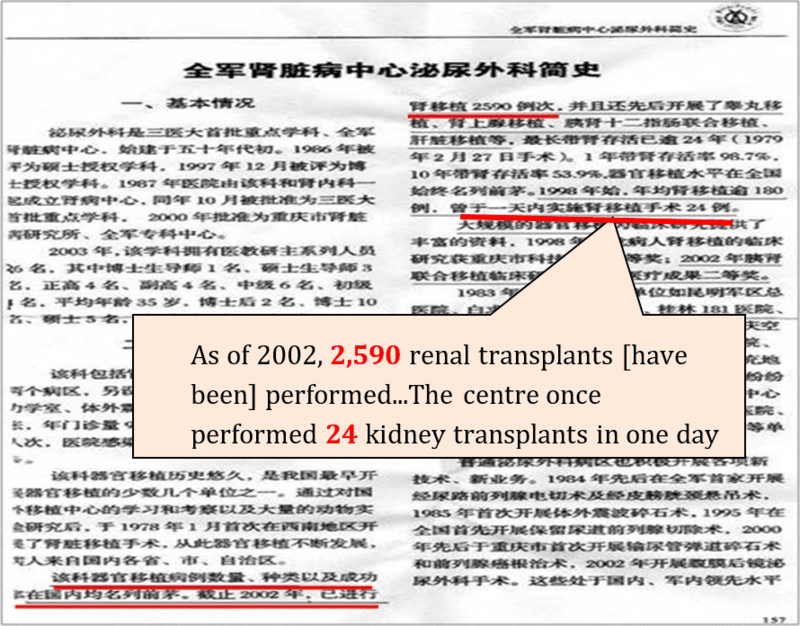 However, according to the Qilu Evening News in 2008, the department once performed 16 kidney transplants in 24 hours. In addition, transplantation.org.cn reported in 2012 that the department’s director, Zhang Aimin, claimed that the hospital had performed more than 2,500 kidney transplants between 1978 and 2012.1666 The total on the hospital’s website in 2016 is 1,000 fewer than Zhang Aimin’s figure from 2012. If this were really the case, the hospital could not have maintained its certification by the Ministry of Health. The hospital also self-reported doing 20 liver transplants each year (the minimum requirement to maintain its Ministry approval). Based on this number, by 2016 it should have performed nearly 400 liver transplants. Using a conservative figure of 70 cases per year from the media report, it would have accumulated nearly 1,000 liver transplants to date. Its liver disease centre has 108 beds and can simultaneously carry out two liver transplants and one regular surgery. Patient rooms are well-equipped with amenities, including five “presidential suites” with high-speed internet access.1671 If we assume that each operating room is used only once per day (otherwise, only one operating room for liver transplants would suffice), it would have performed 800 per year, or 10,000 to date. We estimate that the hospital’s public numbers represent about 1/70 of its actual liver transplant volume. The official transplant figure implies that, in the 13 years after 1998, the centre performed an average of fewer than two liver transplants a year, a figure that far from justifies its bed count and custom-developed follow-up management software. The introduction to the liver transplant centre of the West China Hospital of Sichuan University published on September 2, 2004 mentioned that its five full sets of imported liver transplant equipment allowed five liver transplant operations to be performed simultaneously, and that the centre had 72 beds.1675 CCTV’s People column broadcast a special interview with Yan Lvnan, whose team set a record of performing seven liver transplants on the same day. The webpage claimed that the centre had conducted nearly 800 liver transplants, including more than 260 from relative donors. Based on its bed count and a 30-day average hospitalization duration, the centre would be able to perform more than 800 transplants in a single year. The liver transplant centre no longer appears on the hospital’s website. The most recent search result states that the centre “now routinely performs donation after cardiac death (liver donation after cardiac death) liver transplantation, adult and pediatric living donor liver transplantation, split form liver transplantation, approximately 100 cases per year”. Figure 8.5: Introduction to the Liver Transplant Centre at West China Hospital, published in 2004. By September 2014, the listed number of transplants had shrunk: “the centre has performed more than 2,500 kidney transplants. 1678 From 2011 onwards, more than 200 kidney transplants have been completed annually.” 1679 This volume would require no more than one operating room. Figure 8.6: Introduction to the Kidney Transplant Centre at West China Hospital of Sichuan University, published in 2014. Figure 8.8: The introduction to the People’s Liberation Army Kidney Disease Centre Urologic Surgery Department at Xinqiao Hospital states that it had performed 2,590 kidney transplants as of 2002. However, its current webpage states, “Since our first kidney transplant performed in January 1978, our department has performed more than 2,100 surgeries to date, becoming the third site to exceed 2,000 surgeries in the country.”1681 Compared to its number from 2002 (2590 cases), the current figure after 13 years is 490 cases short, which suggests that the current figure has been deflated. Figure 8.9: Xinqiao's website in 2015 stated that it had only completed 2,100 kidney transplants. Figure 8.9: The hospital's front page dated October 8, 2015 referred to "thousands" of Patients who had received liver transplants at the Navy General Hospital. Figure 8.11: Another page dated on October 8, 2015, stated that it had only performed 300 liver transplants since 1999. Figure 8.12: A report cached in March 2013 states that Huang Jiefu performed more than 500 liver transplants the previous year, one of which was the first voluntary liver donation meeting Chinese standards. It is unclear whether all of Huang’s 500 transplants took place at PUMC, but it is highly likely that some of them would have. This hospital has a strong team of liver transplant doctors trained overseas, with 2 doctoral advisors, 3 Master’s advisors, 5 professors, and 5 attending surgeons and physicians, all of whom hold doctoral degrees. They include Mao Yilei, Sang Xinting, Zhong Shouxian, and other high-profile transplant experts. Due to Huang’s administrative and political duties, his own transplant volume would not be the most prominent. Shanxi Provincial People’s Hospital performed the first heart, liver, and combined pancreas-kidney transplants in the province.1700 It claims to lead the province in liver transplant capabilities. The hospital’s website shows that it has completed 23 liver transplants to date1701–a number equivalent to fewer than two cases per year, fewer than the minimum requirement of twenty to qualify as a transplant centre approved by the Ministry of Health. Fu Yaowen, the founder of the kidney transplantation and blood purification centre at the First Hospital of Jilin University, had completed 3,000 kidney transplants as of April 2009. With 22 other surgeons, this centre carries out a huge number of kidney transplants. However, its website currently shows that the centre has conducted only 3,000 kidney transplants to date. The First Affiliated Hospital of Henan University of Traditional Chinese Medicine’s website states that the urologic surgery department has completed more than 700 kidney transplants to date. However, Wang Guangce’s expert profile on the website indicates that he has experience in leading more than 1,000 kidney transplants, and he has been working at this hospital for most of his transplant career. In a conference notice for December 2014, the website stated that Wang has experience in managing more than 1,400 kidney transplants–400 more than his 2016 total. The website for the First Affiliated Hospital of Chongqing Medical University’s Department of General Surgery claims that it has performed 132 liver transplants since 2001. However, Du Chengyou wrote in his thesis that the research was targeting 10 patients who suffered biliary complications among the 140 liver transplant patients at the organ transplant centre between January and March of 2005. This means that from January to March of 2005, this centre performed 140 liver transplants in two months, greater than the 15-year total on official website. The First People’s Hospital of Yunnan Province has deleted the introduction of its organ transplantation department. Based on an archived version saved on January 9, 2014, it conducted 18 liver transplants between April 2005 and February 2014, and 21 liver transplants so far. However, one of its doctors published a paper about a liver transplant study, for which the patient sample size was six times of the number of transplants the hospital claimed to have performed. The People’s Liberation Army No. 181 Hospital hepatobiliary surgery department’s archived website shows that it has had 50 beds since 2011 and performed over 30 liver transplants in total. However, these numbers were deleted in 2013.1702 The equivalent annual volume of transplants would not meet even the Ministry of Health’s minimum requirement for transplant certification. The Hepatobiliary Surgery Department at Beijing Chaoyang Hospital claims that its liver transplantation is leading in the country. It can carry out almost all types of liver transplant procedures. However, its website states, “To date, this department has completed more than 500 liver transplants.” This volume, less than 30 cases per year on average, amounts to less than a fraction of that of Tianjin Orient Transplant Centre. The hospital’s website states that it has performed more than 3,000 kidney transplants in total, purportedly one of the highest among transplant institutions in China. 1704 This figure translates to less than 200 per year and does not at all match the claim that it is among the highest in the country. According to an introduction published by sohu.com on Aug 3, 2005, Guan Delin at Hua Xin Hospital (the First Hospital of Tsinghua University), had experience in “over 2,700 kidney transplants, over 40 kidney transplants from relative donors, and close to 20 combined kidney-pancreas transplants.”1708 Yet, in May 2006, an introduction was posted on Chaoyang Hospital’s website stating that Guan joined this hospital after having personally completed over 1,000 kidney transplants.1709 The 2006 figure was 1,700 lower than the figure published in the previous year. It has deleted almost all information about its transplant-related activities online. Its website states that it has carried out a total of 19 heart transplants.1711 In the 14 years in which its heart transplant laboratory has continuously expanded, it is unlikely that the hospital has performed less than 2 transplants per year. Source: Hbver.com. June 10, 2004. Source: Health News. 1604 “Liver transplantation and liver cancer research innovation team.” Jiangsu Province Hospital. March 27, 2012. 1607 “Living Relative Donor Kidney Transplants.” Foshan First People’s Hospital. July 27, 2005. 1608 Academician Zheng Shusen: Current Status and Prospects of Liver Transplantation in China. Source: meeting.dxy.cn. June 8th , 2014. 1676 “Sichuan University West China Hospital Clean Surgery Department Engineering Design Document.” Wendang Net. Source: Guangzhou Daily, Dayang Net, March 13, 2013. Source: Chinese Journal of Organ Transplantation. 2013, Volume 34, Issue 5. Authors: Zeng Qstdiang, Yuan Xiao-ye, Zhao Xin, Cao Jing-lin, Gao Qing-jun, Dou Jian.